Pour the cup of corn starch into a large bowl. Use a spoon to scoop the shaving cream on top of it. Put 5-10 drops of food coloring on top. Stir to mix. When the mixture looks like grated cheese, use your hands to squish the mixture even more. Pretty soon the shaving cream and corn starch will form a ball, about the same texture as dough. If your mixture is really wet and sticky after mixing, it needs a little more corn starch. If it won’t stick together and falls into pieces, add a little more shaving cream. That’s it! Try sculpting snow angels, snowmen, or make a tiny snow fort! The tiny pieces of corn starch get mixed into the shaving cream and suspended in the mixture. 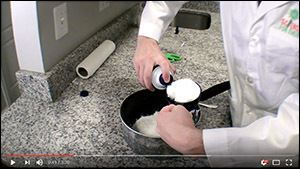 Shaving cream is mad of tiny tiny bubbles, and the surface tension on the surface of the bubbles helps ‘float’ the corn starch particles when the two mix.